One of the trail projects that Parks is excited about this year is the extension of the Green River Trail north to meet up with the City of Seattle’s Duwamish River Trail. For those of you that haven’t yet explored this awesome trail, the Green River Trail winds more than 19 miles from the Green River Valley to the Duwamish River in Tukwila. 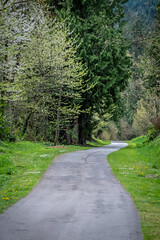 The trail provides excellent views and access to the Green River and surrounding river valley from our Cecil Moses Park near Seattle’s southern boundary to Kent’s North Green River Park, near Auburn. The trail links industrial lands to pastoral landscapes, parks, communities, and river views. A great trail for weekend recreational journeys, it’s also a vibrant commuting corridor for people on bicycles. In the future, the south portion of the trail is slated to continue through Auburn and eventually follow the Green River all the way to Flaming Geyser State Park at the Green River Gorge. While I’d experienced the trail southwards from the Tukwila Community Center, I hadn’t yet checked out the current northern terminus, just past Cecil Moses Park. Starting at the park, I quickly found the literal end of the trail about 900 meters north. From there, I followed West Marginal Place South into South Park, catching sight of the Duwamish River Trail signage. Continuing along the Duwamish River Trail as it meandered through the neighborhood of South Park, along the edge of West Marginal Way South, past the skate park, the South Park Community Center, and down to the edge of the water, I was excited to be exploring a new area of my community that I’d never seen. Sure there might have been some stripped down cars along the way, and riding along W Marginal isn’t exactly breathtaking, but the art at 8th Ave S and the Duwamish River was a surprise, as were the many industries in the community still devoted to shipping and Seattle’s importance as a port city. The creatively named Terminal 107 Park, and the trail’s jog down to the shore of the Duwamish before the park, along with the abutting Herring’s House Park were a welcome respite from the sidewalk trail ride along W Marginal Way SW. The Duwamish Tribal longhouse was right across from Herring’s House Park with its stark reminder of a tribal leader’s heritage in the area. Even the West Seattle Trail Fishing Dock was a fun find on my way downtown. Some place I can picture taking my son to watch boats and catch some fish on another sunny afternoon. While these trails are in need of some attention, it’s good to get out and see that even in their currently imperfect state, they still offer an amazing variety of history, nature, culture, and recreation for everyone to enjoy. Pick a trail, go for a ride. It truly is #YourBigBackyard. Get out there and enjoy it.